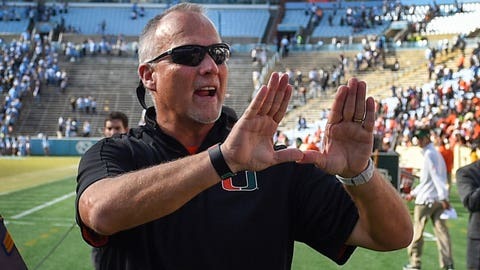 Mark Richt has led Miami to the country's longest winning streak and is one of five unbeaten teams in major college football. CORAL GABLES, Fla. (AP) — Miami has the country’s longest winning streak and is one of five unbeaten teams in major college football. It is on the verge of its first trip to the Atlantic Coast Conference championship game. A bunch of ugly wins made that possible. The Hurricanes, who fell one spot to No. 9 in the AP Top 25 on Sunday after squeaking out a 24-19 victory at one-win North Carolina, aren’t about to apologize. Miami (7-0, 5-0) hosts No. 13 Virginia Tech (7-1, 3-1) this weekend in a game that could decide the ACC Coastal Division title, and then welcomes No. 5 Notre Dame (7-1) the following week. It’s the biggest two-week stretch for Miami in years, and the Hurricanes are fully aware of the opportunity. Miami has won 12 straight games, three more than any other school in America. It’s the longest streak for the Hurricanes in 15 years. But Miami’s last four wins have been by a combined 18 points, and against some struggling opponents. Those wins over Florida State , Georgia Tech , Syracuse and North Carolina all had plenty of drama, even though those teams are a collective 11-20 this season and only the Yellow Jackets are currently over .500. But if Miami beats Virginia Tech on Saturday, combined with a Georgia Tech victory at Virginia, the Hurricanes will be the ACC Coastal champions. The Hokies would take control of the Coastal race if they win Saturday. This will be the 12th time since 1994 that the rivals have met with both teams in the AP Top 25, but the first such game since 2010. That hasn’t been the case, at least not consistently, over the last four weeks. The other four unbeatens — No. 1 Alabama, No. 2 Georgia, No. 4 Wisconsin and No. 15 UCF — are winning by an average of 28.3 points in conference games, 28.6 points overall. Miami’s margin of victory, on average: 8.6 points in ACC games, 13.3 overall. “In the end, if you win, that’s the bottom line,” Richt said. Miami’s had some ugly wins, yes. But many teams would gladly trade places. Memphis is 4-0 in games decided by eight points or less, tied with the Hurricanes for the nation’s best record in those circumstances. Kentucky, Michigan State and South Carolina are all 4-1 in one-possession games. Baylor is 0-8, having lost four one-possession games and two of those to Top 25 opponents. Buffalo, UMass, Miami of Ohio, Purdue, Tulsa and Coastal Carolina all have four one-possession losses. Florida State is having a disastrous season, falling from No. 3 in the nation to last in the ACC’s Atlantic Division largely because of three defeats by six points or less. Duke is 4-5, with three of those losses by exactly seven points. The epitome of that might be Eastern Michigan. A break here or there — or six breaks — and the Eagles might have been the college football darlings of 2017. Instead, they’ve lost six games in the last six weeks to fall to 2-6, all those defeats coming by a touchdown or less, all against teams that are almost certainly headed to bowl games. Eastern Michigan coach Chris Creighton was asked if his team felt “snakebitten” by its run of no-luck. That’s the area where Miami has excelled. The Hurricanes make critical plays at critical times. But against Virginia Tech and Notre Dame, the Hurricanes know continually playing with fire won’t be a great idea.